Una señora escuchaba cerca de su casa siempre el lloro de perritos y se acerque a una finca en la que tienen cabras y las que lloraban eran dos perritas metidas dentro del corral de cabras, en muy mal estado, llenas de garrapatas, pulgas y demás; una de ellas estaba preñada, a punto de parir y muy inchada, su dueño dijo que las tenía para tirar por un barranco por que las iba a quitar. Ella las cojí, las llevo al veterinario, pero tristemente la madre hacia por lo menos tres días tenía un perro atravesado y muerto, trataron de operarla pero a pesar de su fortaleza y tras tanto sufrimiento no fue posible salvarla (el medico has dicho a ella que ese abandono animal era denunciable), pero lo que ella hice fue recuperar la hija. Se lo llevo a su casa y ahora esta muy bien, ha perdido el miedo, ha aprendió a jugar y es muy limpia y tan sumisa y buena. La señora pidió ayuda ahora a ANAHI porque ya tiene 3 perros mas en su apartamento y la dueña de la casa no lo permite tener mas. Princesa es una mezcla de chihuahua, tiene mas o menos 7 meses y pesa 3 kilos, esta vacunado y lista para adoptar. A woman did hear always close to her home the cry of dogs and she got close to a farm where they have goats and what was crying were two dogs closed in inside a goat pen, in very poor condition full of ticks, fleas and also one of them was pregnant, about to give birth and very swollen. Their owner told the women that he was going to pull them over a cliff because he had to remove them anyway. She took the dogs to the veterinarian, but sadly the mother had gave birth at least three days ago and she had one puppy dead inside. They tried to operate her but despite her strength and after so much suffering it was not possible to save her (the doctor told her that this abandoned animal is to denounce), but what she did was taking care and recover the daughter. She took her home and now she is in a good state, she has lost her fear, has learned to play and is very clean and very submissive and good. The lady asked ANAHI for help because she has 3 more dogs in her apartment and the landlady does not allow having more. Princess is a chihuahua mix from about 7 months old and weights 3 kilos, is vaccinated and ready to be adopted. Eine Frau hörte in der Nähe ihres Hauses das Heulen von Hunden. Sie ging dem nach und kam zu einer Finca, wo Ziegen gehalten werden. Das Jaulen kam von 2 Hunden, die in einem Ziegenstall eingesperrt waren, in sehr schlechtem Zustand, voller Zecken und Flöhe. Eine Hündin war auch noch trächtig, kurz vor der Geburt und aufgebläht. Der Eigentümer sagte der Frau, dass er sie in einen Barranco werfen wird, da er sie ohnehin loswerden will. Sie nahm die Hunde mit und der Tierarzt stellte traurigerweise fest, dass die Hündin schon 3 Tage zuvor geworfen hatte und sie noch ein totes Baby im Bauch hat. Man versuchte sie zu operieren, aber sie war schon so geschwächt und nach all dem Leid war es nicht möglich, sie zu retten. Der Tierarzt riet der Frau zu einer Anzeige, aber sie nahm die Tochter mit, um sie zu umsorgen und aufzupäppeln. Sie ist nun bei ihr zu Hause, in einem guten Zustand, die Angst ist weg, hat gelernt zu spielen und ist sehr sauber, gehorsam und lieb. Die Frau bittet ANAHI um Hilfe, denn sie hat noch 3 andere Hunde in ihrer Wohnung und die Vermieterin erlaubt keine weiteren. Princesa ist ein ca. 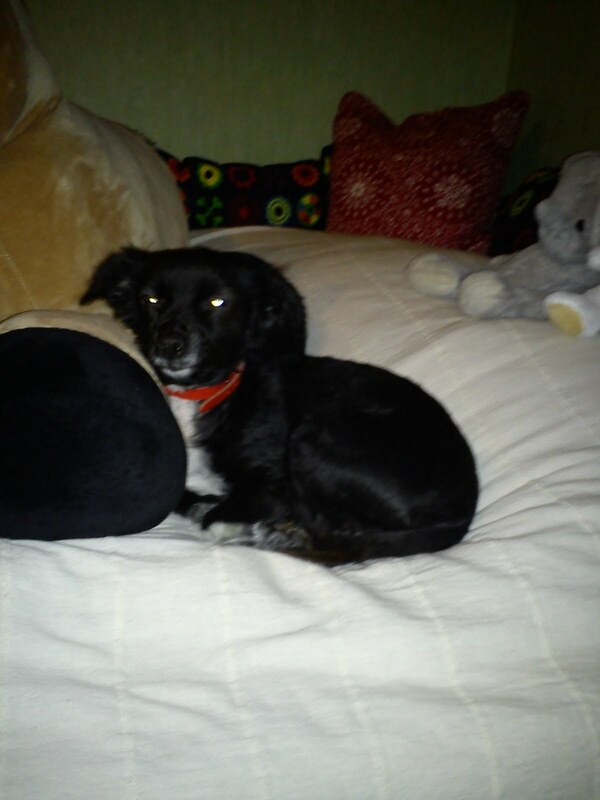 7 Monate alter, 3 kg schwerer Chihuahuamix, geimpft und bereit zur Adoption. Stella, nuestra secretaria y voluntaria de ANAHI esta en el Hospital desde ayer, causa... una neumonia. Desde aqui mandamos todo nuestro cariño a ella y esperemos que te recuperas pronto! Un beso para ti de todos tus compañeros de 2 y 4 patas! Stella, our secretary and volunteer from ANAHI is in the hospital since yesterday, because she has pneumonia. From here out we send her all our love and we hope she will recover soon!! A big kiss for you from all you 2 and 4 leg colleagues!! Stella, Sekretärin und Freiwillige von ANAHI, liegt seit gestern mit Lungenentzündung im Krankenhaus. Von hier aus liebe Grüsse und wir hoffen, dass sie bald wieder gesund ist. Einen dicken Kuss für dich von allen 2- und 4-beinigen Kollegen!! 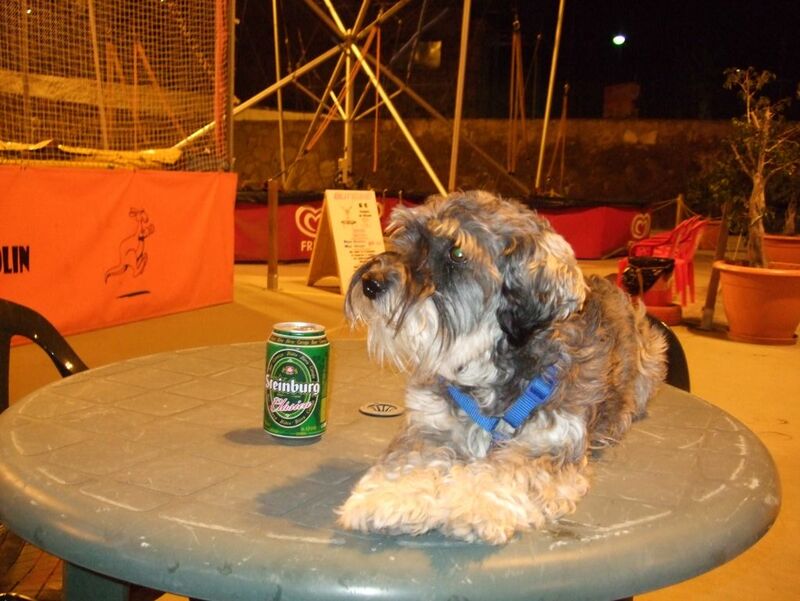 En nuestro nuevo lugar podemos estar todos los días con los perros y en el horario que quieremos.No es solo para nosotros una alegría, también los perros disfrutan ahora que hay salidas y paseos todos los dias de la semana! In our new place we can be all the days with the dogs any time we want. This is not only a happiness for us, but as well for the dogs, they are enjoying it that they go for a walk every day of the week. In unserem neuen Heim können wir an allen Tagen und zu jeder Zeit bei den Hunden sein. Das ist nicht nur für uns schön, sondern auch für die Hunde. Sie freuen sich über jetzt tägliche Spaziergänge. Teseo, filarias positivo, paso dos dias malos por ser tratada de este enfermedad. Hoy ya estaba mucho mejor, todavia tiene que estar en reposo, asi tenia solo un tiempito de pasear por el patio. Pero para Teseo era sufficiente.... tan felice estuve olfateando todos los rincones... y clara dejando ahi tambien su olor! Teseo, heart-worm positive, was having 2 bad days for the treatment of this disease. But today he was already a lot better, he still has to rest, so for this he only had a small walk in the garden. But this was enough for Teseo...... he was happy to smell each corner..... and of course leaving his smell behind! TESEO, Herzwurm positiv, ging es während der ersten 2 Tage seiner Behandlung schlecht. Aber heute ging es ihm bereits viel besser. Er braucht noch Ruhe und deshalb lief er nur ein bisschen im Garten herum. Das reichte TESEO……. er war glücklich in allen Ecken zu schnüffeln….. und natürlich seinen eigenen „Duft“ zu hinterlassen! ADA und TOM sind in ihrem neuen Zuhause sehr glücklich…. y quien no va estar feliz en un lugar tan bonito!!!!!!!!!!!!!!!!!!!!!!!!!!! and who will not be happy in such a beautiful place!!!!!!!!!!!!!!!!!!!!! und wer wäre nicht glücklich an solch einem idyllischen Ort !!!!!!!!!!!!!!!!!!!!!!!!!! Este gato estaba abandonado en la calle en Vecindario y una señora recogió y estas cuidando hasta encuentra un nuevo hogar para el. El gato es joven todavía y muy cariñoso y juguetón. Están buscando urgentemente una familia para el. This cat was abandoned on the street in Vecindario and one lady took him home and is taking care of him until they find a new home for him. The cat is still young and is very sweet and playful. They are looking urgently for a new family for him. Dieser Kater wurde auf einer Strasse in Vecindario gefunden und eine Frau nahm ihn mit nach Hause und kümmert sich um ihn, bis sie ein neues Zuhause für ihn gefunden hat. Der Kater ist noch sehr jung und verspielt. Sie suchen dringend eine neue Familie für ihn. Con todo nuestro trabajo de la mudanza, porfin podemos poner fotos de algunos de nuestros perros adoptados! Tenemos las fotos de BRITA que se adopto hace poco en Alemania. Desde de ser una perrita callejero que tenia cada 6 meses una camada de cambiar en una perrita feliz, viviendo como uno mas de la familia . Gracias para mandarnos fotos y de adoptor a BRITA! After all the work of the move, finally we have time to put some pictures from some of our adopted dogs! 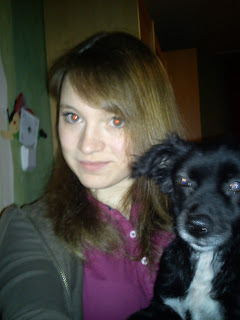 We received some pictures of BRITA who got adopted a little while ago in Germany. From a street-dog, who had every 6 months a nest of puppies, she changed into a happy dog, living like one more in the family. Thank you for sending us the pictures and adopting BRITA! Nach der ganzen Arbeit mit dem Umzug haben wir endlich Zeit, einige Bilder unserer adoptierten Hunde zu zeigen. Wir erhielten einige Fotos von BRITA, die kürzlich in Deutschland adoptiert wurde. Von einem Strassenhund, der alle 6 Monate einen Wurf Welpen hatte, verwandelte sie sich in einen glücklichen Hund, der wie ein weiteres Familienmitglied lebt. Vielen Dank für die Bilder und die Adoption von BRITA! KIRA, esta adoptada aqui en la isla de Gran Canaria por Monica y Glauco.Ella pasa sus vacaciones en familia en Italia, asi tambien Kira es una perra viajera! Aqui en la foto....con una cervecita bien fresquita!!! !No, no... no es para ella!!! Pero la esta vigilando para que nadie se la lleva!! KIRA got adopted here on the island by Monica and Glauco. She is spending her holidays with the family in Italy, so also Kira is a traveling dog! Here on the picture with a nice cold beer!!!! No, no...... this is not for her!!! She is only watching that nobody will take it away!! KIRA wurde von Monica und Glauco hier auf der Insel adoptiert. Sie verbringt ihren Urlaub mit der Familie in Italien, so ist auch KIRA ein Reisehund! Auf diesem Foto mit einem leckeren kalten Bier!!!! Nein, nein… das ist nicht ihres!!! Sie passt nur auf, dass es keiner wegnimmt!! Tambien recibimos fotos de BARI. El esta muy feliz en su nueva hogar con su nueva familia. Como pueden ver... tambien en Alemania hay un tiempo de maravilla y BARI no se lo penso mucho.... a tomar el sol!!! Also we received some pictures of BARI. He is very happy in his new home and his new family. As you can see...... as well in Germany the wetter is marvellous and BARI does not have to think twice..... sunbathing!!!!! Auch von BARI erhielten wir Fotos. Er ist in seinem neuen Heim mit seiner neuen Familie sehr glücklich. Wie ihr sehen könnt………. auch in Deutschland ist das Wetter wundervoll und BARI muss nicht zweimal überlegen……. sonnenbaden!!!!! GRACIAS POR MANDAR FOTOS Y ESPEREMOS QUE ASI A MAS SE LO ANIMAN DE MANDARNOS TAMBIEN SUS FOTOS!! THANK YOU FOR SENDING US THE PICTURES AND WE HOPE TO ENCOURAGE MORE PEOPLE TO SEND US THEIR PICTURES!! DANKE FÜR DIE ZUSENDUNG DER FOTOS UND WIR HOFFEN, DASS AUCH ANDERE ANIMIERT WERDEN, IHRE FOTOS ZU SCHICKEN!! Aprovechando de pasar por la casa de acogida para sacar algunos fotos, en este caso la de SPIKE y SPOCK. Taking advantage of stopping by a foster home to make some pictures, in this case the foster home of SPIKE and SPOCK. Wir nutzten die Gelegenheit bei einer Pflegestelle vorbeizufahren um Fotos zu machen, in diesem Fall bei der Pflegestelle von SPIKE und SPOCK. Estan cada dia mas grande, gandules total como todos los perros de raza muy grande y estaban muy revueltosos por la mañana. Each day they are getting bigger and bigger, totally lazy like all large breeds but very active in the morning. Sie werden von Tag zu Tag größer, Faulenzer wie alle großen Rassen, aber morgens sehr aktiv. 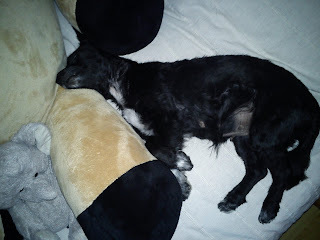 TITI (en la misma casa de acogida) es una perrita muy señorita y tiene a todos los machos de la casa a su ordenes! TITI (in the same foster home) is a young lady and she has all the males in the house on her orders! TITI (in der gleichen Pflegestelle) ist eine junge Dame und hat die ganzen Kerle im Haus unter ihrer Fuchtel! Arbeit im neuen Heim, saubermachen…..
reparieren der Wasserleitungen und Holzplatten……. aber auch Zeit für ein Schwätzchen……. und wir bereiten uns auf den angekündigten Regen vor…. Petra y Frank han venido a Canarias para ayudarnos un poco en el nuevo ALBERGUE DE ANAHI. Nos trajeron este preciosa foto de FANNY, adoptado por ellos . Petra and Frank came to Gran Canaria to help us a little bit at the NEW SHELTER OF ANAHI. They brought us this beautiful picture of FANNY, adopted by them from Anahi. Petra und Frank sind nach Gran Canaria gekommen, um uns in unserem NEUEN HEIM VON ANAHI zu helfen. Sie brachten uns dieses schöne Bild von FANNY mit, die sie von ANAHI adoptiert hatten. Tambien nos trajeron muchas collares, correas,2 bolsas de viaje ,un transportin de viaje, todo comprado en FRESSNAPF-Brühl con un parte del dinero de donaciones. Ademas nos entregaron 300 € de la ultima loteria en FRESSNAPF en conjunto con regalos dado por NESTLE PURINA ALEMANIA. Tambien las galletas, donado por NESTLE PURINA. Also they brought us a lot of collars, leashes, 2 travel-bags, one transport-box, all bought in FRESSNAPF-Brühl (Germany) with some money of the donations. As well they gave us 300 € from the last lottery at the FRESSNAPF shop together with gifts from NESTLE PURINA GERMANY. The cookies (treats) are also donated by NESTLE PURINA. Auch brachten sie uns etliche Halsbänder, Leinen, 2 Reisetaschen und eine Transportbox mit, alles bei FRESSNAPF-Brühl mit einem Teil der Spenden gekauft. Zusätzlich überreichten sie uns 300 € der letzten Tombola im FRESSNAPF Shop zusammen mit Geschenken von NESTLE PURINA DEUTSCHLAND. Die Hundekekse wurden ebenfalls von NESTLE PURINA gespendet. GRACIAS A TODOS EN NOMBRE DE LOS ANIMALES DE ANAHI! THANK YOU SO MUCH ALL IN NAME OF THE ANIMALS FROM ANAHI! Herzlichen dank an alle Im Namen der Tiere anahis! Despues de atender a todos nuestros perros y sus paseos era la hora de la comida.....Sandy oliendo esto rico comida...solo pensaba; como entra en este cubo????? After giving attention to all our dogs and their walks it was time to eat...... Sandy here smelling the delicious food..... only thinking; how do I get into this bucket????? Nachdem wir uns um alle Hunde gekümmert und sie ausgeführt hatten war Essenszeit……. Sandy riecht das leckere Futter…….. und überlegt: Wie komme ich nur in den Eimer????? Esto son nuestras vista..y tambien de los perros. El domingo aprovechamos de estar un buen rato con ellos y fuimos a abrir caminos para ellos! This is our view..... and as well from the dogs. Sunday we have used to be a long time with the dogs and we took some time as well to open a way for their walks! Das ist unser neuer Ausblick…… auch für die Hunde. Sonntag haben wir viel Zeit mit ihnen verbracht und uns die Zeit genommen, einen Weg für ihre Spaziergänge freizumachen. LELA muy relajada, descansando un momento de su pelota, es un imagen de lo mas bonito. LELA very relaxed, taking a break of her ball, a beautiful imagine. LELA sehr entspannt, mal ohne ihren Ball - ein schönes Bild. Paseando a los mas pequeños juntos con lo mas revueltosos, Nando y Guapa . Brandy y Matti tomando un poco agua. Walking the small ones with the most rougher ones, Nando and Guapa. Brandy and Matti taking some water. Spaziergang mit den kleinen zusammen mit den unruhigen NANDO, GUAPA, BRANDY und MATTI, die das Wasser genießen. Teseo es filarias positivo y despues de tomar su medicación pre tratamiento, mañana y pasada toca su tratamiento! 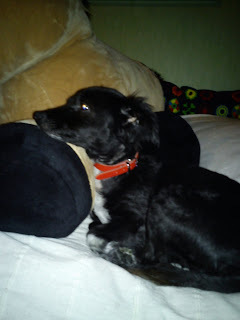 Teseo is heart-worm positive and after taking his medication for the pre-treatment, tomorrow and the day after he will have his heart-worm treatment. TESEO ist Herzwurm positiv und nachdem er seine Medikamente zur Vorbehandlung genommen hat, bekommt er morgen und übermorgen seine Behandlung. Nuestra matrimonio; ADA y TOM explorando nuevo terreno mientras Niña y Teseo pasan tambien por el agua. Our marriage couple; ADA and TOM discovering new ground, while Niña and Teseo passing by the water as well. Unser „Ehepaar“ ADA und TOM erkundet neues Gelände, während NIÑA und TESEO auch den Bach überqueren. Despues de los paseos, jugar en el patio toca la comida! Aunque Chico y Guapa se preguntan...por ahi no es la salida?????? After the walks and playing in the garden it was time for food! Although Chico and Guapa were thinking...... is there no way out there????? Nach Auslauf und spielen im Garten ist Essenszeit! Nur CHICO und GUAPA überlegen…… gibt’s hier keinen Ausgang???? Ya devuelta a su jaulas.... y como pueden ver Matti y Brandy muy felices juntos en su nueva jaula. And then it was time to go back into the cages.... and as you can see, Matti and Brandy are very happy in their new cage. Dann war es Zeit, zurück in ihre Zwinger zu gehen……. und wie zu sehen ist, sind MATTI und BRANDY in ihrem neuen Zwinger sehr zufrieden.